One of the most improved broadcast teams in all of baseball during the 2014 season belonged to the Philadelphia Phillies. Heading into the season, CSN Philly revamped their booth, ousting long-time broadcasters Gary Matthews and Chris Wheeler. The color commentators to replace the pair alongside returning play-by-play man Tom McCarthy were Jamie Moyer and Matt Stairs. Each former player worked with McCarthy as a pair for roughly 60 games each, with the remaining games taking being called by the trio. However, Moyer won’t return to the booth in 2015, citing a desire to spend more time with his family. It’s a damn shame too, because Moyer was incredibly good in his role. He was funny, blunt, and insightful – he wasn’t afraid to go against the party line, and could break down a pitcher like no other. McCarthy, Stairs, Sunday broadcaster Mike Schmidt, and roving reporter/fill-in PBP man Gregg Murphy will all return for 2015. I don’t know how the McCarthy/Stairs pairing will work on a long-term basis. Will Stairs have the devotion and commitment to take on a full slate of games in 2015, or will the Phillies add another color man to the group to help lighten the load? (Please, anyone but former MLB Network analyst Mitch Williams.) I liked Stairs during the games he called, but he almost seemed shy and uneasy for a good chunk of the season. I will say this about the Phillies crew, no matter what ends up happening – they’re in a better place than they were a year ago. McCarthy seemed more animated and motivated this season after seemingly going through the motions in 2013. The club still has a fantastic radio crew of Scott Franzke and Larry Andersen. Murphy is excellent in his largely thankless role. 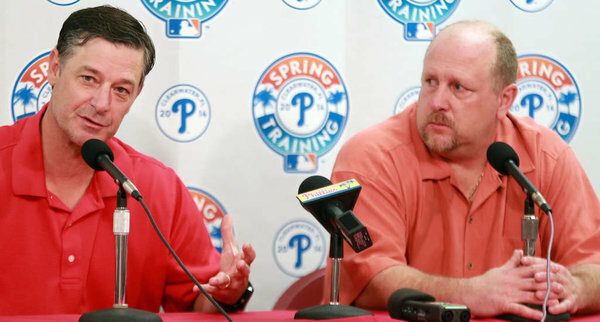 Moyer will be missed by Phillies fans. The lasting image I’ll have of Moyer is him and McCarthy dressed up as Obi-Wan and Chewbacca on Star Wars Night at Citizens Bank Park. Would you ever expect Wheels or Sarge to have done that?